Amplified and Captioned Telephones are a helpful addition to many homes. Amplified Telephones come in cordless or corded models with a variety of features, most importantly an adjustable, amplified sound level so you can hear your callers more clearly. We offer free amplified phones through the state STAP program. Please contact us for more information. CaptionCall is the world’s best captioning telephone designed to help people with hearing loss use the phone to stay socially connected with loved ones, conduct important business, and best of all, maintain confident communications for a longer, happier, healthier life. Click here to learn more about how CaptionCall works. We're committed to your better hearing. That's why we offer a Risk Free 30-Day Satisfaction Guarantee plus After Care Benefits. 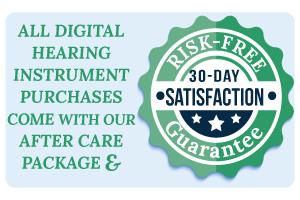 You will love ReSound Linx3D hearing instruments. And we can adjust them for you remotely from just about anywhere.